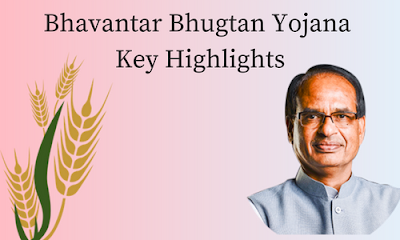 Madhya Pradesh Chief Minister Shivraj Singh Chouhan launched ‘Bhavantar Bhugtan Yojna’ On October 16, 2017 to hedge price risks in agriculture wherein farmers will be compensated for distress sales at prices below Union government-announced minimum support prices (MSP) in the presence of the farmers at the Krishi Upaj Mandi in Khurai, Sagar district of Madhya Pradesh. To make sure that farmers get reasonable prices for their crops and provide the compensation for agriculture products whenever its price fall below the announced minimum support prices (MSP). The objective of this scheme is to protect them from losses suffered because of distress sale. Under this scheme, farmers will be compensated the difference between Minimum Support Price (declared by Union Government) and the actual sale price or model Price, whichever is higher. Model Price will be the average market prices for a particular commodity over a two-month period in Madhya Pradesh and two other states where the crop is grown and traded. The amount will be deposited in the bank account within a period of 2 months. At first, compensation under the scheme will be provided for eight crops including oil seeds and some pulses etc. For instance, if the MSP for soybean is Rs 2500 per quintal and the modal rate is Rs2,200 per quintal, if a farmer sells the crop at Rs2,300 per quintal in a mandi (wholesale market), the government will pay out Rs200 for every quintal sold directly to the farmer’s bank account. However, if the crop is sold at Rs2,100 per quintal, the state will transfer only Rs300 per quintal of produce sold, or the difference between MSP and the modal price. To avail the benefits farmers will have to register their crops at village-level cooperative societies along with their Aadhaar and bank account numbers also farmers are required to sell their crops only in mandis and obtain a receipt for the same. Government set a panel tasked with revamping MSP, which was headed by Ramesh Chand, who is currently a member of federal think tank NITI Aayog.